"; } //rel="lightbox[show]" }; thishtml=thishtml +"
"; var point = new GLatLng(lat,lng); // create the marker var marker = createMarker(point,thishtml,markercount); markercount=markercount +1; map.addOverlay(marker); bounds.extend(point); MyMarkers[f] = lat + "|" + lng + "|" + thishtml ; } i = f; //Debug section //allhtml=allhtml+"
"+thishtml; // document.getElementById('debug').innerHTML = "" + allhtml + ""; //dbf.value=allhtml; //document.write ("
I got a lot of help from the Google Maps API Tutorial by Mike Williams. Image Display uses Lightbox JS v2.0 under a Creative Commons Attribution 2.5 License. The map displays my flickr photos that have been geotagged. The map is made with the google maps API and the Update uses http://phpflickr.com/ to access the flickr API. Only need to update when there are new geotagged photos, eventually will auto update once a day. I needed to store the list of photos and locations locally as there seems to be a wee bug in the flickr API which strips the decimal point and - out of geo tags when searching for photos, so you have to make a query for each photo which takes too long for using on this page. Clicking Update will show you how long. 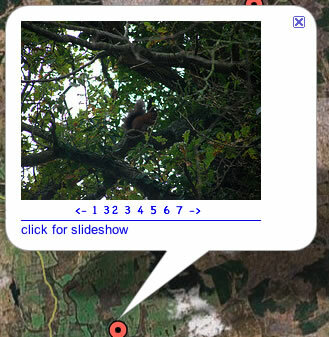 The update script creates a file with the information about my geotagged photos. I guess it would be more portable to use xml to store data, but I don't know that much about it.